The Mutable signs prepare for change into the next season. This makes the people of this group highly adaptable, flexible and communicative. Throw a curve to a Mutable sign and they can turn on a dime, coming up with solutions faster than you can bat an eye. Mutable signs are restless and embrace change. They are the most resourceful of all the signs, and thus, they make much from little. They are highly detail-oriented, but should take care not to get so wound up in tiny particulars that they lose sight of the whole. Gemini’s need for stimulation can not be overstated. Highly intellectual, Gemini needs news and information like oxygen. Being an Air sign, Gemini enjoys the exchange of ideas with others - this is no loner. The sound of a phone’s dial tone is as comforting to Gemini as the sound of a mama’s heartbeat to a baby. One Gemini friend has confessed that her fax machine going off sounds like the love call between two mating whales, a sound that thrills her because it means news is on the way (we will be sure to get my friend professional help soon). Seriously, being an adaptable Mutable sign, Gemini’s mind is always going at the speed of light. They can put various pieces of information together in a multitude of ways, and this makes them quite good at figuring things out, be they instructions to the VCR, the facts of a murder case, or the intricacies of the Congressional budget. Gemini can change their position as quickly as they assimilate new information, remaining at all times objective. Gemini’s downfall? Their adeptness at handling several things at once can lead them to assume too much responsibility. At that point they can become scattered or begin to procrastinate. If they stay focused, they can accomplish more in a day than most of us do in a week. Virgo is more practical than Gemini and just as intelligent. This sign seeks to devote its substantial communicative talents to concrete goals. Virgo is less likely than Gemini to become scattered by trying to do too many things, and yet more likely than Gemini to become bogged down in the details. Virgo’s fastidiousness and precision is unmatched by any other sign. They polish their work until it shines, for Virgo’s overwhelming desire is to feel productive. Don’t tell a Virgo to relax and chill out, for most members of this sign have not quite mastered that ability. They feel badly if they waste time. Being an Earth sign, their powers of organization are amazing and it’s this skill which gets Virgo tangible results they can measure, compare, assess and perfect (a Virgo word if there ever was one). But Virgo isn’t rigid - far from it. Virgo’s Mutability allows for a willing flexibility and razor-sharp course corrections mid-way, an asset Virgo keeps hidden up their laundered and starched white sleeve. Sagittarius expresses its hefty intellect in the realms of philosophy and spirituality. People of this group also enjoy delving into the differences and similarities of various cultures. Sagittarius Fire nature craves adventure and likes to feel a sense of exploration in the projects he takes on. Whereas Gemini focuses on the daily details of current events, Sagittarius focuses on the underlying moral or ethical implications of issues, past or present. Like all Mutable signs, Sadge is curious, but it’s pro-active Fire element makes Sadge the sign most likely to explore and debate hypothetical situations (communication being the dominant quality of a Mutable sign). For a fun time, they listen to National Public Radio and watch Meet the Press. Keeping up with this high octane Mutable/Fire sign is hard, but well worth the effort. Pisces use their Mutable nature to explore and adjust to the feelings (Water’s domain) of others around them. Since Mutable signs are communicative, Pisces takes the concerns of those around them seriously and will always offer information, sympathy, advice - whatever is appropriate to the situation. Pisces ability to adapt is so strong that he almost literally becomes the person he is trying to help and he often does not see the borders of where he stops and the other person begins. 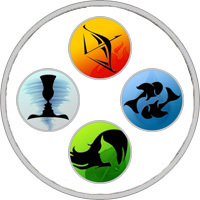 This can be hard on Pisces, for long after the other person has settled whatever has troubled them, Pisces’ strong intellect continues to chew on the ramifications and various issues involved. They need closure, so if you ask a Pisces for advice, be sure to let him know later what action you took and the results you experienced. If you don’t, your Pisces will be in a perpetual state of anxiety over your condition. One last word: show appreciation to your Pisces. Taking too big an advantage of Pisces good nature is a cosmic no-no.